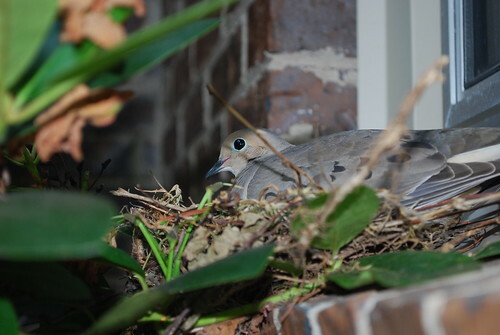 We have a bird (I think it is a dove) that built a nest right outside our bathroom window. Look how close I got to her. I took the photo below a couple of weeks ago. I took the one below last night. Yesterday morning as I was getting ready for work, I heard the bird making noises. My husband told me that there are now 3 birds. I could not believe how big the baby birds are already. The mom flew off as I approached and the nest is no longer there, but the two baby birds just sat there watching me. I took SO many photos and that is the best one. Those little guys were tucked back in the corner and I had to just hold my camera up and shoot. I love discovering new things in our yard. I cant believe how close they let you get either! That is so cool. I love the first too. I cant decide which one I like better! Shoot - I forgot to mention, I love your new header! What a treat! 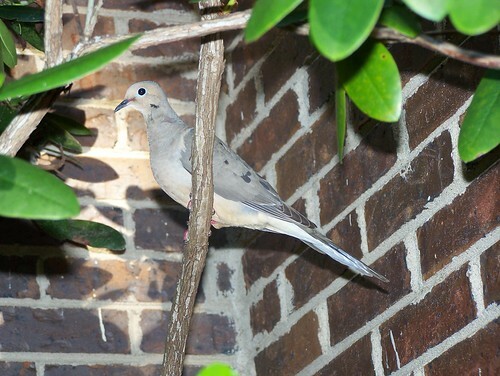 I love mourning doves. We had some in our rain gutters about a month ago but I don't know if there were chicks, it was too far up to check. Its fun to play with photos and see how different you can make them look. Why would the nest be gone? 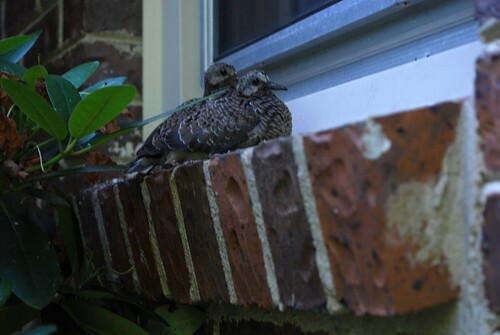 I've been shooing away birds from our porch because I'm afraid they are looking for a place to nest. We have a dog. And they poop EVERYWHERE.